I was asked about the Oui title match in the comment field on Google+. Some people may think this move first. It's possible. △P45 used to be played in official games, not many games though. And some professionals have reconsidered △P45 these days. I also think there is still a lot of other lines. In fact, △P45 was played in recent official games. The silver has to move back to 37. It seems like two turns loss, going out and back, however, sente considers the square on 45 as the struggle point. At Diag.2, sente has two options, (1) ▲R48 (2) ▲P46. This move means taking back the point 45 with the rook and the silver. 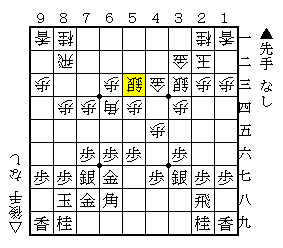 Although gote advances the silver with △S (53) -44, sente can attack with two pieces. gote defends with just one silver. 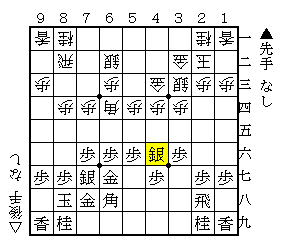 Here, a few players advance the gold with △G44 instead. If ▲P46 is pushed, △R42 would add more power to 45. In this case, the number of pieces is 2 to 2, equal (Diag.3). Gote can keep the point 45. It's an option. Instead of ▲Bx46, to take the pawn with silver is not good. In reply to △P*45, the silver must retreat again. If taken, the bishop can promote and gain a lance. 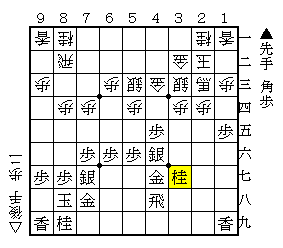 At Diag.4, sente's threat is to drop the pawn on 45 and gain a foothold for the attack, such as ▲P*45 △S53 ▲P35 △Px ▲Sx △P*34 ▲S44. Here, gote plays △P*47, which is a tactical move. If taken with the rook, △B*38 would be a rook-knight fork. The place where the rook run to is difficult. In all cases except for ▲R38, a horse (+B) is made by △B*48. It's not good for sente. 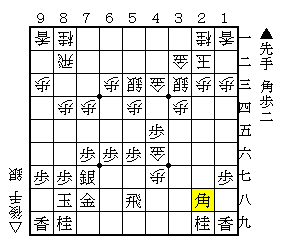 ▲R38 is the best position, although a horse is also made by △B*49 ▲R28 △P48+ ▲Rx △Bx27+ (Diag.5). From here, sente is going to aim at the horse rather. 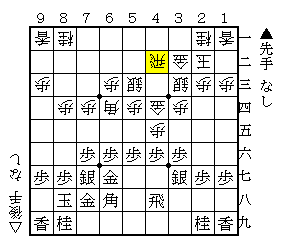 ▲G57 is a joseki move. The meaning of this move is to suppress the horse with the gold. When ▲G47, △+B14 is also considered (△+B26 is also an option). After that, it proceeds with ▲P16, △P24, ▲P15, △H (+B) 23 ▲N37 (Diag.7). There are not many squares for the horse to move around. From Diag.7, sente will structure the formation, aiming at the horse like ▲R28, ▲P*25. 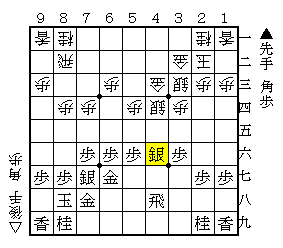 Although the horse is a very strong piece, it's said that sente is slightly better as the king's head is the weak point. After cutting the horse with △Hx47, gote is able to gain a silver by dropping pawns in hand. It may look like gote is better because of exchanging bishop-gold, silver. But, ▲B*28 is a tactical move. Gote has difficulty in helping the gold. If △S*57, replied with ▲Rx, △Gx, ▲Bx82+, sente would be better. And if △S*35, ▲P*36 would be a severe move. Actually, after it proceeds with △P48+, ▲Rx, △S*57, ▲Bx46, △Sx+, ▲Rx, I suppose it's still a close battle. I will write about (2) ▲P46 next time.